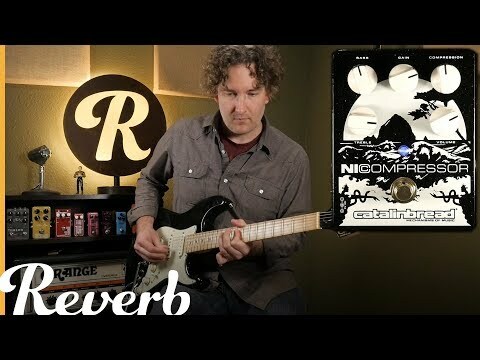 The Catalinbread Nicompressor Compressor pedal - soft pearl finish. FREE shipping in the USA! Expanding on the concept of uncompromising tone, these knobs boost desired frequencies, bringing them to the surface. The Treble brightens your tone, making it sparkle, even when compressed. The Bass enhances the lower-frequencies and increases sustain when turned up. The Gain allows you to experiment by adding some grit or grain to your sound. Staying true to its inspiration, this single knob design allows you to find the sweet spot and make adjustments simply and effectively. When turned up, the compressor sends out a hot signal, boosting from within. When turned down, the next effects in the chain boost the compression. All premium analog components, through-hole construction.